Soda Ban Regulating – Is This the Right Way? The other day I read an article on the New York Times website written by the former vice president of global affairs at the food giant, Kraft Foods, who retired in 2004. His article entitled How to Force Ethics on the Food Industry started by pointing out the New York City court’s recent overturning of the “NYC soda ban” which was upheld 6 months ago by the New York Board of Health. For those of you that don’t remember, in September 2012 Mayor Bloomberg proposed the “soda ban” law in NYC and it would have been put into effect starting this week. If this ban had been upheld, diners in NYC would only be served drinks in 16 ounce cups or smaller. Immediate critics of the ban included McDonalds and Coca-cola (while hospitals and nutritionists applauded). 2) At least it will bring the problem of obesity and large portion sizes to the spotlight. Well, I was right with both of my predictions. I don’t drink soda, I really never have, how could you after seeing a tooth rot away after a couple of days in a cup of soda? I can’t imagine why people constantly put it in their bodies, but that’s part of the glory of America, the right to choose. However, this right to choose foods that have no nutritional value is actually hurting America. New York City spends an estimated $4 billion a year on healthcare costs for overweight people. 58% of New York City residents are considered overweight or obese. In his article, Michael Mudd, states that the only way to start taming obesity is by controlling the food industry. Unlike cancer and tobacco, there is no “direct link” so food companies can constantly point fingers at all of the other factors including lack of physical activity, lack of time for home cooked meals, etc. I have to agree that the problem stems from a combination of factors – however – the food industry has now resorted to lying on their packaging. They say things like “All Natural,” “The Nutritious Way to Start Your Day.” Honey Combs even has itself listed as an “Excellent Source of Vitamin D.” Really? The only reason there’s any Vitamin D in that cereal is because they have scientists adding it to all the sugar and corn! It’s out of control! My problem with this is the same problem that happens when people sue McDonalds for the coffee being too hot or the burgers getting them fat… really? Are we as Americans that neglectful of our own bodies that we leave it in the hands of people we have never met and who only want our money? I find that to be ridiculous. Everyone is responsible for their own actions and we should read the nutrition labels, stay away from the interior of food markets, and cook dishes at home using real ingredients. Yes, it’s ok to “cheat” and use a pre-made meal once in a while, but we have to remember that every time we “cheat” we are not cheating the system, but really our health. Take the extra 10-20 minutes and cook something that will actually feed your body with the nutrients that it needs. I believe that we are inherently craving nutritious food, but all of the marketing around us is telling us differently. We have become addicted to sugar (that’s a whole other article but here’s some information if you’re interested), fat, and salt. Yes, our body does need these things, but we’re not consuming the right types of sugar, fat and salt. We’re ingesting fake fat and low nutrients calories. I could go on and on… so I’ll just get to the point. We live in a society run by capitalism, right? So if consumers start demanding better foods with better labeling, shouldn’t food companies listen to the market and start to listen to the demand? I think so, which is why the organic movement has actually become profitable! Parents and schools should work with their children and students in understanding the value of nutritional food. There should be free cooking classes that provide parents with quick and cheap meals that are nutritious. We have to invest in our youth because they are our future. A huge plus is that if the kids are eating healthy, most likely the parents will be too. It’s a win win situation. Michael Mudd stated in his article that regulators need to control marketing for children. Part of me agrees and part of me doesn’t. When I was a kid I was brought to McDonalds once a week for a “Happy Meal” (that’s genius marketing) where I could get a toy. It would be new every week and I would collect them. I think I was more interested in the toy at the time than the food. The point is that there was no way I was getting a “Happy Meal” unless I was driven there by an adult who also paid for it. 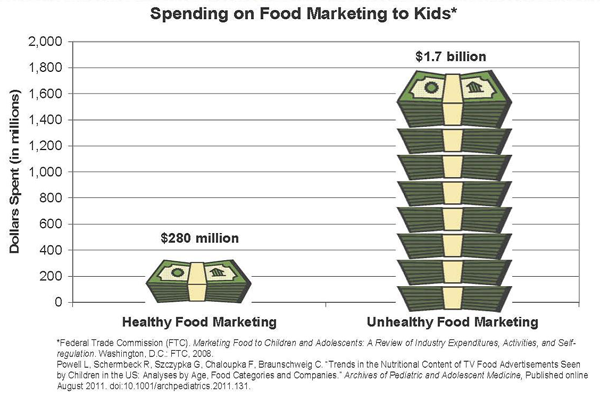 Kids can be marketed to, but parents are the ones making the decisions in the end. So even though I did have a Happy Meal, it was a treat that I didn’t get often, and it was only with an adult. I was never obese or overweight, neither were the adults in my life (probably a combination of genetics and healthy living), but I learned from the adults about food and then I continued to make my own healthy choices as I got older because my body continued to crave them. To this day I would still rather have a plate of broccoli than a box of fries – it tastes so much better and my body feels so much better. One area in which I do believe the government can help is in their food subsidies, their promotion of what crops are being planted, the FDA’s accountability with farmers and food companies, and regulating package labels. The food system is so vast and overreaching, but each of us has to do their part. Consumers can start consuming healthier options, parents and schools can educate, and the government should start protecting its citizens against a system that is ruining the health of America.